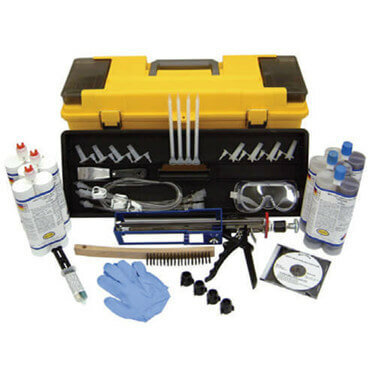 The Mar-flex Contractor 30′ Crack Repair Injection Start-Up Kit (Product # IAT-64100) is designed to provide everything needed for entry-level crack filling applications. Our start-up kit provides basic materials and supplies to repair cracks of approximately 30 linear feet. The kit also includes a DVD of complete instructions, ensuring you’ll have no problems handling even the toughest cracks. Mar-flex Contractor Crack Repair Injection Start-Up Kit comes in a handy toolbox.